Mick Fanning? Yes. Shark? Yes. Attack? Discuss amongst yourselves. It’s already pretty clear that all the fuss about the “shark attack” situation that Mick Fanning got into at J-Bay is here to stay. Not just because people are mindlessly sharing it on their social media, creating funny memes or analyzing how this event is the best thing that could ever happen to the WSL. Furthermore, even his mom’s reaction has made it to the news, adding to the turmoil of shark attack shenanigans. First of all, I want to let the readers know that the purpose of this article is not to talk down on Mick’s bravery and the courage that it took to “fight back” against the shark. However, my focus here will be on the facts, backed up by scientific research, personal experience, and the opinion of some colleagues. Please keep in mind that this is not a contradicting article, it’s just an effort to give the audience the right information so they can make up their own minds, and so my mom can have some peace of mind when I’m out surfing. In case you’re wondering who am I to write this, I’ve been diving since I was 12, which gave me multiple opportunities to dive with several kinds of sharks. Everything from the playful nurses and the menacing bulls, to reefsharks, hammerheads and huge Galapagos sharks have all peacefully glided right before my eyes. This led me to study marine biology (eventually dropping out because surfing is better) and to meet leading shark researchers like Mauricio Hoyos and Edgar Becerril, who work with these mighty beasts in Guadalupe Island. So to shed a little light on this already controversial topic, I talked to Edgar and dug a bit deeper into the biological aspects and attack statistics. By now, most of us have seen those photos showing the silhouettes of a seal and a surfboard from below. The similarity between the two shapes is chilling. Small wonder that mistaken identity has been cited as a probable explanation for White Shark attacks on surfers. From morphological and physiological studies, it is known that White Sharks have excellent photopic (bright-light) color vision. But does the White Shark actually rely on such a search image? Recently, Scott Anderson has equipped a surfboard with an underwater camera and trolled this rig along the surface at South Farallon. Analysis of the filmed attacks on the board reveal that the Great White typically stalks its ‘prey’ by swimming along the bottom and strikes by launching a lightning-fast, vertical attack. This is consistent with the theory that the White Shark makes use of a search image when hunting pinniped prey. Great Whites are known for their “bite and spit” feeding strategy, in which they bite and then let go of its prey two out of three times. Shark researcher Peter Klimely figured out that sharks can taste the amount of fat that the prey has, and by having a little taste, they can evaluate if it would be worth it (metabolically speaking) to digest such prey. I invite the readers to check out the research, and learn more about how Great Whites hunt, live and play a major role in the dynamic balance of our ecosystems. Bottom line is, that Mick’s shark attack was actually an encounter. 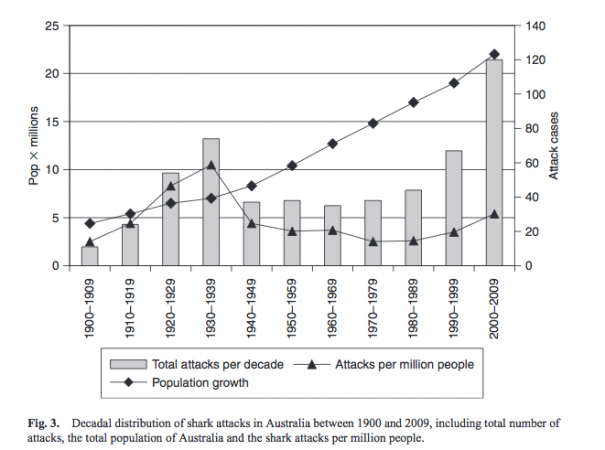 There is a very interesting scientific research paper on the “Changing patterns of shark attacks in Australian waters” Which not only defines what the criteria is to record an attack in the 218 year old database, but also adds on how the identification of the attacking species should be done and most importantly what the circumstances of the attacks were. Although this might be somewhat irrelevant because the encounter happened in South Africa, the surfer is Australian, so that should be enough reason to look at the data. If you can’t figure out what these graphs mean, let me break it down for you. As it is explained in detail in the full paper, an increase in the population plus an increase in the popularity of surfing and other ocean tourism activities have been the major role in the increase of attacks. 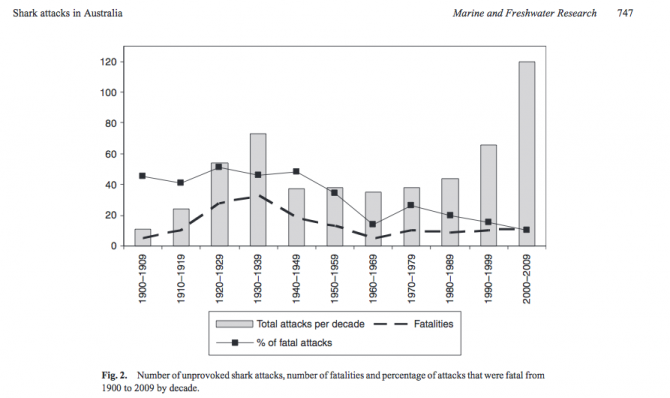 There has been a 310% increase in attacks on surfers since 1999. Also worth noting is the fact that most attacks happen in remote locations where shark protection plans have not been placed in action. Another key factor is water temperature. As the data shows, more attacks happen in colder waters. This means that the wetsuit plays a role in the extension of the time that a surfer can spend in the water, therefore, increasing the risk of encountering a shark. Besides these factors, shark population fluctuations must also be taken into account, however, it has been found that shark culls and other fishing activities have actually decimated their numbers. It is important to keep the risk of a shark attack in perspective. On average, 87 people drown at Australian beaches each year (SLSA 2010), yet there have been, on average, only 1.1 fatalities per year from shark attack over the past two decades. It is clear that the risk of being bitten or dying from an unprovoked shark attack in Australia remains extremely low. Bottom line is, you are most likely to die getting hit by a coconut in the head or drowning than being eaten by a shark. You can paddle out now. 3. What If Mick were actually “prey” material ? As we have read so far, he probably would have tasted awful and too neopreney to the shark, who would have released him just in time for the jet skis to come rescue him. Worst case scenario, he loses part of a leg or an arm, he becomes another Bethany Hamilton type celebrity and the surfing fanatics all over the world shed a tear when he paddles out for his first WSL heat after his recovery. A movie would probably be shot too, and little groms all over the world would idolize Mick even more than they do now. The conspiracy theorist inside of me tells me that this was all a collaboration scheme between WSL’s ambitious directors and their newest partner, Dr. Evil, whose remote controlled laser bearing sharks would be a good resource to stage an attack and go viral. Minus the LASER, wouldn’t that be rad if it were true ? Bottom line is, attacked or not, Mick is still the hero of the story. 4. Shark Repelling Technology and what the real issue is. We have seen innovators take to the drawing board and try to come up with practical solutions for shark repelling technology. Such are the examples of the wearable bracelet Sharkbanz competing with another company called noshark. 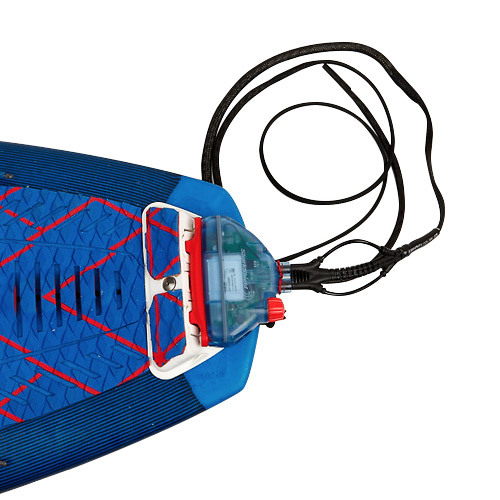 We also have sharkshield, the guys who invented this weird looking stomp pad attachment. Even if the pros started wearing these kinds of tech, whether it’s required or not by the WSL in “dangerous” waters such as Jeffreys Bay, it’s not a real solution, and it’s not looking at the real problem. The truth is that the non-marine-biology-geek population out there (including my mom) is not aware of the fact that sharks are misunderstood creatures, and the effect that finning, culling and even old movies can have on our perception of sharks. Even when an encounter is rare, and even rarer to be caught on a worldwide livestream, what the media causes the people to believe is a horrifying lie. What really should be going viral is the fact that our perception of sharks is completely wrong, and that a staggering 73 million of them are getting killed every year to cope with the absurd demands of the finning trade market. This is not even an over-estimate–in fact, some experts believe it could be doubled and still it wouldn’t be close to reality. The saddest part is that even if this information also went viral, there is very little we could realistically do about it, because it’s all about the money, both for the fishermen who do this to put food on their table, and for the WSL who could have not have had a better way to gain massive viewership. Sharks deserve to be given a closer and more compassionate look, they deserve to roam whichever waters they might find prey, and they deserve to survive as much as we do. Finally, I’d like to add that anyone like you and me or any shark-loving scientist would have freaked out and reacted the way Mick did when encountering a shark in such a way. The surprise factor and being focused on winning a final probably made it even more dramatic. If you actually end up reading this, Kudos Mick, your bravery is outstanding.